Nepal is a beautiful country with various tourist attractions. The presence of mountains is one of the reasons that attract many tourists every year to this country. But that is not just it. The country also boasts of remarkable historical and cultural attractions like temples and monuments. With a remarkable variation in nature, culture, geography, Nepal has emerged as a go-to holiday destination for people all around the world. If Nepal is in your bucket list, you can visit a number of places in Nepal. You can choose one depending on what you want to explore during your Nepal tour. Pashupatinath temple is one of the oldest and most renowned temples in Nepal. It lies on the banks of Bagmati river in Kathmandu. This is one of the temples which is on the list of UNESCO World Heritage Sites. Thousands of Hindu follower visit this temple on the Maha Shivaratri festival every year to gain the blessings of the divine deity. This temple is basically the collection of different ashrams, temples, and inscriptions which has been there for a long period of time. It is also a cremation site where the Hindus perform their last rites. Visitors watch curiously from across the river from the hill. During your Pashupatinath temple visit, it is also very common to meet Sadhus. Sadhus are wandering ascetic yogis, who are trying to acquire liberation from the cycle of death and rebirth by meditating. They have a very unique appearance and are very tourist friendly and always eager to pose for photos with foreigners. Hence visit Pashupatinath Temple for an out of this world experience. Key attractions: Golden Spire of the temple, silver sheeted doors, Panch Deval Complex, and the lingams. Boudhanath also known as Boudha lies 7 km northeast of Kathmandu. It is one of the largest Buddhist stupas in the world built during the 5th century AD. Boudhanath has been an important place of pilgrimage. And, meditation for Tibetan Buddhists and local Nepalis for centuries. The Great Stupa of Boudha is the focal point of the district and is also a popular tourist site in Nepal. There are at least 29 Tibetan Gompas around Boudhanath. Here you will see many maroon clad Tibetan Buddhist monks. And nuns along with local people walking around the stupa while repeating the mantra ( Om Mani Padme Hum). There is a belief that anyone who prostrates in front of the stupa and circumambulates it with no ill thoughts in their hearts receives good karma. The surrounding here is very clean and peaceful with many shops and restaurants that overlook the magnificent white stupa. Key attractions: 29 Tibetan Gompas, the prayer wheel, delicious momos. And Thukpa in the surrounding restaurants. Swayambhu Stupa often called the Monkey Temple is an important pilgrimage site for the Buddhists. And this place sees its fair share of tourists being easily accessible from the city. Swayambhu means “self-existent one”. According to translations from an inscription dating back to 460 A.D, King Manadeva built it. And by the 13th century, Swayambhu had developed into an important center of Buddhism. Swayambhu Stupa sits atop a hill, overlooking most parts of the valley. And, the exceedingly steep stone steps leading up to the shrine is quite a challenge. However, there is also a road going up almost to the top and you can drive up. Once you reach the top, you can catch panoramic views of the city. The site itself stands as a hallmark of faith and harmony for centuries. The stupa is the oldest of its kind in Nepal and has numerous shrines and monasteries on its premises. Key attractions: 365 steps to reach the temple, the magnificent golden shire. The huge Tibetan prayer wheel, and the painted Buddha statues. Thamel is a popular place in Nepal for the tourist. This area is great to buy clothes, jewelry, souvenirs, etc. This place is basically a tourist hub. It has lots of narrow alleys with various shops on each side of the road. Also, there are numerous restaurants that cater to the needs of tourists. From Korean to continental food to Chinese, you will find all kinds of restaurants to eat that suits your taste. And because of the increasing traffic in Nepal, the streets of Thamel is a vehicle free zone which helps to avoid traffic and crowd. Moreover, if you are looking for budget hotels to stay in, then this place is perfect for you. Thamel is undoubtedly one of the happening places in Nepal where you will also find clubs. Hence all these reasons make Thamel one of the best places to visit in Nepal. Key attractions: Newari style design, jewelry, embroidered jacket, accessories, and souvenirs, Restaurants and bars. Patan is one of the three royal cities of Nepal and is something to keep your eyes on. It is a famous tourist place in Nepal. And is mainly known for its rich architecture, amazing wood carvings and an air of spirituality. Built in the 17th century, the palaces, courtyards, and temples of Patan Durbar are the city’s main attractions. And before the disastrous earthquake of 2015, Patan housed more than 1200 monuments, each unique on its own way. However, there still are enough tourist attractions to relish. With its multi-columned facade. And gilded spires, the recently restored stone Krishna Temple is particularly striking. Most tourists prefer a day trip here due to its close proximity to the capital. Overall it is a great place to enjoy the beauty of its courtyards and square at a leisurely pace. Moreover, it is one of the best places in Nepal to buy the gorgeous handmade saris that were once the garment of choice of the country’s royalty. Key attractions: Rich architecture, wood carvings, Krishna Mandir, Patan Museum, Mulchowk, Golden Temple. Bhaktapur is one of the best among Nepal tourist attractions. Here you can shop for terracotta, handicraft products, clothes, and souvenirs. The history of Bhaktapur goes back to about the 8th century. This place was the capital of Nepal from the 12th to 15th century. In the 18th century, this place became a country on its own with boundary walls and gates to the city. The locals of Bhaktapur are mostly peasants, handicraft manufacturers or businessman. Many tourists visit this city every year which helps in the economy of the city. The city looks very beautiful with red bricks everywhere. You will also find various animals in this area as a pet. Overall the city is one of the best tourist places in Nepal unaffected by modernization which to date remains authentic and simple. Key attractions: Terracotta products, lotus, and pretty handicrafts, and colorful masks. Nagarkot is among the go-to tourist places in Nepal located close to the Kathmandu valley. This is just about 4 hours drive from Kathmandu city and is a peaceful get away from the city. One can enjoy the natural beauty of all different mountain ranges. From Nagarkot, the major Himalayan peaks you will get to see are Manaslu, Ganesh, Langtang, Dorje Lakpa, Gauri Shankar, etc. On a clear day, one can even see the tip of Mt Everest (8,848 m) from here. Arriving here in the afternoon and staying at one of the local hotels will give you the opportunity to see both sunsets. And the early morning sunrise over the mountains. Be aware that the clouds may obscure the view, even in autumn, when the air is usually clear. Key attractions: Trekking, mountain biking, stunning views of Himalayas. And the dense pine tree forests. 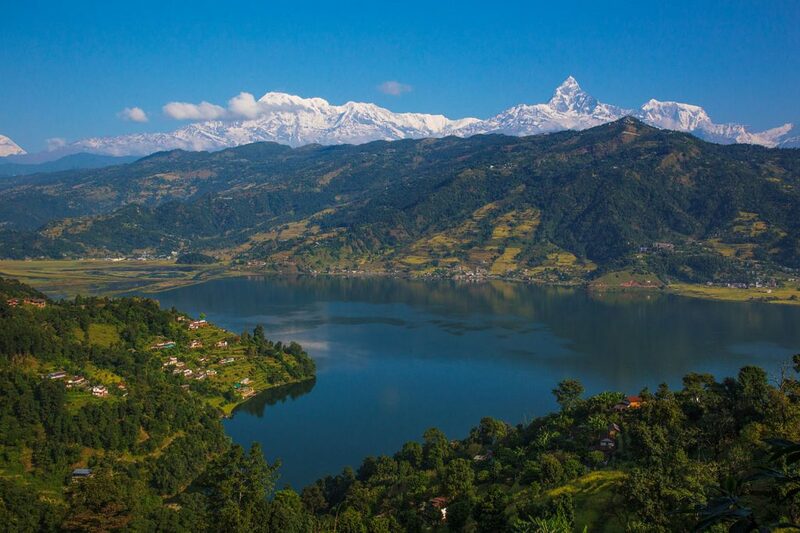 Nestled amidst the Annapurna Himalayan range, Pokhara is the jewel of Nepal. It is the second largest valley in Nepal. Among the famous Nepal tourist attractions, Pokhara sees the largest number of tourists every year. It is a touristy place in Nepal and a great place to relax. This area is about 203 km away from the Kathmandu valley and lies in the Gandaki zone. While in Pokhara one can never get bored. This place is clean and peaceful with a clear view of the Himalayan ranges. Pokhara is also famous for outdoor and adventure activities. Such as boating, rafting, bungee jumping, paragliding, zip flying, and various other extreme sports. Pokhara valley also consists of a lot of lakes which is another reason why this place attracts many tourists. Overall, Pokhara ticks all the right boxes. With spectacular scenery, adventure activities, accommodation, and food choices galore. Hence visit lakeside Pokhara for a perfect getaway and to recharge your mind and soul. Key attractions: Verdant forests, Lakes, blue skies, underground caves. Waterfalls, Davids falls, Valley of Orchids, and majestic views of mountains. If you want to witness a different side of Nepal, then visit Chitwan National Park. It is one of the UNESCO’s world heritage site which is a natural abode of wildlife. The tropical monsoon climate makes this area a perfect place for wildlife viewing and jungle safari. This is the first National park in the country and is one of the best places to visit in Nepal with amazing resorts. Earlier, people used to hunt here. But later the government decided to make it a National Park so that all animals are able to stay. While in Chitwan you can do so many things. Some of which are going on an elephant safari, capturing the beautiful flora, spotting the enchanting fauna. Here you can even row a canoe. And one of the best things to do is to visit the Chitwan Tharu village. Here, the Tharu tribes residing in the vicinity perform the Tharu folk dance which is one of the major attractions of this park. Hence a trip to the village is a must to take a peek into their culture and traditional cuisines which will be a wonderful and memorable experience. Key attractions: The park is home to rhinoceros, freshwater dolphins, sloth bears. Witness Tharu culture and their folk dance. The Sagarmatha National Park is one of the most visually appealing masterpieces on earth. Surrounded by magnificent Mt. Everest along with various other peaks, deep ravines and Himalayan glaciers, it is one of the best places to visit while in Nepal. About 135 km away from Kathmandu, this nature reserve is a UNESCO world heritage site. With diverse flora and fauna, you will find every aspect of nature’s charm beautifully preserved here in Sagarmatha. Also, this place provides a range of wildlife including Himalayan Tahr, Musk deer, snow leopards, wolves, lynx, etc. Besides a number of animal species, Sagarmatha National Park is also home to over a thousand rare to endangered bird species. Some of which are Himalayan Monal, Snowcock, Yellow-billed Chough, Red-billed Chough, etc. Hence a visit to this paradise is a must while in Nepal to witness all the beauty this place has to offer. Key attractions: Diverse flora and fauna, rare bird species, stunning Himalayan views. Bandipur is a perfect place to take a break in the long journey between Pokhara and Kathmandu. It is a living museum of Newari culture, a beautifully preserved village crowning a lofty ridge. Here one can go on a trek around the town for picturesque views overlooking the Nepali countryside. Moreover, you can also see a glimpse of the Annapurnas on a clear day. Time seems to have stood still here. The major attraction in Bandipur is the breathtaking mountain view, Newari culture, and lifestyle. You can extend one night at Bandipur while returning from Pokhara to Kathmandu or from Kathmandu to Pokhara. You have to take a short diversion from Dumre to uphill for Bandipur. Key attractions: Typical Newari settlement, Famous Siddhi cave. A Short hike around Bandipur village, Orange garden, panoramic view, etc. Lumbini, the birthplace of the Buddha is a serene pilgrimage site. It lies in Nepal’s Rupandehi district. An abode of Buddhism, the entire area is a UNESCO World Heritage site with stupas and monasteries lining the entire Lumbini. This is one of the foremost sites of Buddhist pilgrimage. People from all over the world come here to study scriptures. And learn about the religion of peace, contemplate and refresh their heart and souls. Lumbini is the place if you want to reassess your life, find inner peace and discover yourself. The aura of positive energy in the air is bound to rejuvenate your mind. Here you can involve yourself in Yoga and meditation. The air here radiates serenity and calm. And Lumbini today is as popular as it is historically significant. Key attractions: The Maya Devi Temple, which lies amidst a large park that comprises of lakes and monasteries. Visiting Nepal is definitely a worthy experience. Despite being a small country, it has so much to offer. And one can visit numerous places with great natural beauty and cultural diversity. Unlike other countries, traveling is budget-friendly with hundreds of best places to visit in Nepal. So, what are you waiting for? Grab your bags and plan your trip to Nepal. For further question or queries, please feel free to contact us. It is our pleasure to guide and assist you with the best of our knowledge.